Kierkegaard has always enjoyed a rich reception in the fields of theology and religious studies. This reception might seem obvious given that he is one of the most important Christian writers of the nineteenth century, but Kierkegaard was by no means a straightforward theologian in any traditional sense. He had no enduring interest in some of the main fields of theology such as church history or biblical studies, and he was strikingly silent on many key Christian dogmas. Moreover, he harbored a degree of animosity towards the university theologians and churchmen of his own day. Despite this, he has been a source of inspiration for numerous religious writers from different denominations and traditions. 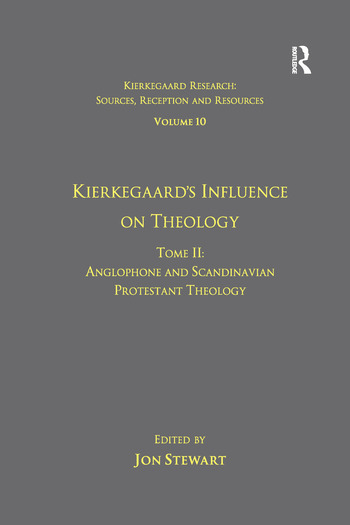 Tome II is dedicated to tracing Kierkegaard's influence in Anglophone and Scandinavian Protestant religious thought. Kierkegaard has been a provocative force in the English-speaking world since the early twentieth century, inspiring almost contradictory receptions. In Britain, before World War I, the few literati who were familiar with his work tended to assimilate Kierkegaard to the heroic individualism of Ibsen and Nietzsche. In the United States knowledge of Kierkegaard was introduced by Scandinavian immigrants who brought with them a picture of the Dane as much more sympathetic to traditional Christianity. The interpretation of Kierkegaard in Britain and America during the early and mid-twentieth century generally reflected the sensibilities of the particular theological interpreter. Anglican theologians generally found Kierkegaard to be too one-sided in his critique of reason and culture, while theologians hailing from the Reformed tradition often saw him as an insightful harbinger of neo-orthodoxy. The second part of Tome II is dedicated to the Kierkegaard reception in Scandinavian theology, featuring articles on Norwegian and Swedish theologians influenced by Kierkegaard. Contents: Part I Anglophone Theology: Edward John Carnell: a skeptical neo-evangelical reading, Silas Morgan; Harvey Gallagher Cox, Jr: an uncomfortable theologian wary of Kierkegaard, Silas Morgan; Stanley J. Grenz: an unfinished engagement with Kierkegaard, Paul Martens; John Alexander Mackay: the road approach to truth, Mariana Alessandri; Hugh Ross Mackintosh: Kierkegaard as 'a precursor of Karl Barth', David J. Gouwens; John Macquarrie: Kierkegaard as a resource for anthropocentric theology, David R. Law; Reinhold Niebuhr: the logic of paradox for a theology of human nature, Kyle A. Roberts; Gene Outka: Kierkegaard's influence on Outka's writing on neighbor love, equality, individuality and the ethical, Sarah Pike Cabral; Francis Schaeffer: how not to read Kierkegaard, Kyle A. Roberts. Part II Scandinavian Theology: Gisle Christian Johnson: the first Kierkegaardian in theology?, Svein Aage Christoffersen; Anders Nygren: influence in reverse?, Carl S. Hughes; Indexes.